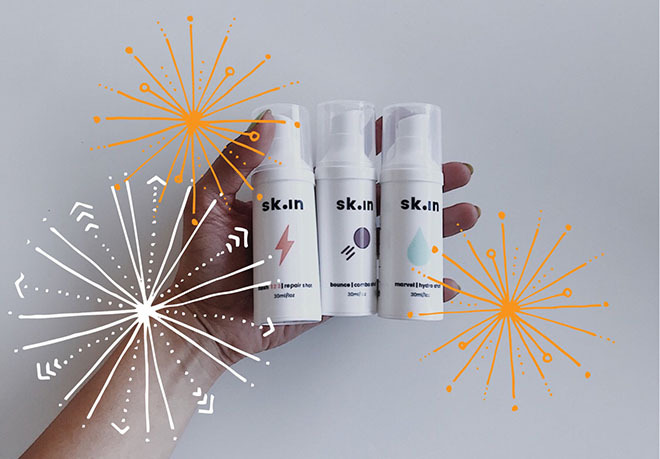 Short for “skin ingredients”, the latest local brand to grab the attention of editors and bloggers is sk.in, a range of power-packed serums formulated by well-respected medical aesthetics practitioner, Dr Alek Nikolic. The range consists of five serums, each one containing clinically-proven, prescription-grade active ingredients. The serums can be seamlessly included in an existing skincare routine, and each one is designed to target a specific skincare concern. Dr Nikolic selected active ingredients that are known to be less sensitising (to limit undesirable effects) and more stable. This makes it suitable for more skin types (yay!) and limits the risks of unwanted side effects often associated with the likes of vitamin C and retinol. Because most people have an outer skin barrier impairment, and the health of this barrier is so important for skincare ingredients to be absorbed correctly, each serum in the sk.in range has barrier-restoring properties. “I started using my selection of sk.in products at probably the perfect time. I had just returned from a week-long island holiday, and although I was super chuffed with my all-over golden glow, I was horrified to find the barely-there freckles on my nose had darkened significantly, and what’s more, I had new sun spots all over my cheekbones. I am very fair, so pigmentation on my skin is extremely noticeable. My religious application of SPF50 throughout the day clearly wasn’t enough! As a result I jumped at the chance to try this new range of products (after all, if Dr Nikolic is involved, it has to be good!). sk.in gloss – applied in the morning, this serum releases a powerful antioxidant radiant shot to counteract the signs of UV and environmental damage. Reduces pigmentation, increases collagen and hydration and minimises fine lines and wrinkle. Contains vitamin C.
skin.in flash – applied at night, this serum delivers a potent repair shot to repair skin texture and hydration, minimise pore size, increase collagen production and diminishes pigmentation. Contains retinol. 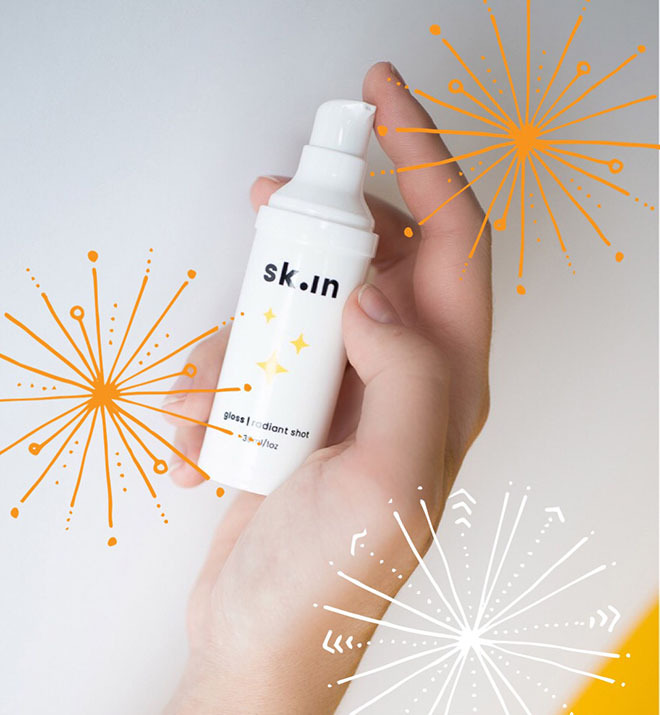 sk.in marvel – applied twice a day before gloss / flash, this serum delivers a hydro shot to the skin, repairing and protecting the skin barrier structure and function. Contains hyaluronic acid. I was advised to start using the products intermittently, as skin is known to react when exposed to active ingredients for the first time. Luckily I am a long-time user of retinol (vitamin A) so I wasn’t too worried about that, but I hadn’t used vitamin C in a very long time, so I was careful and started by using sk.in gloss twice a week, then three times, until I got to every day. I used the serums exactly as directed and paired them with my trusty Lamelle Nourish Cleanser and Serra Restore Cream (and plenty of SPF, of course!). After cleaning, I applied gloss in the morning (and flash at night), followed by marvel, followed by my moisturiser. I thought that the extra step of a second serum would be a nuisance, especially when I am in a rush in the morning, but to be honest, it didn’t hamper me at all. I loved that none of the serums had a strong scent and that they absorbed faster than I anticipated. It’s important to mention that I experienced no peeling, flaking, sensitivity or discomfort of any kind (I’ve experienced this with certain retinol and vitamin C products before). This range is definitely gentler on the skin than many others I have tried. Fast forward to about eight weeks later and I am beyond thrilled to report that my freckles are *almost* back to their barely-there shade of beige, and the spots on my cheekbones have lightened significantly. I haven’t had a single breakout since I started using the range (I’m prone to hormonal blemishes from time to time) and my skin looks radiant and healthy. I’ve even left the house without foundation a couple of times (unheard of for me!) and felt 100% comfortable with my skin. sk.in is available exclusively on www.skiningredients.com and from salons and aesthetic practices. sk.in flash – R880 for 0.6%, R980 for 1% and R1250 for 2% 30ml.